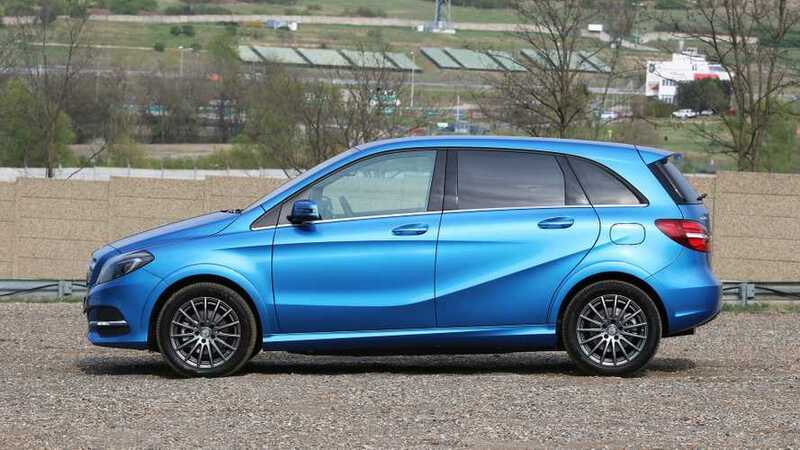 Though it’s sold with a variety of engine options in other countries, the Mercedes-Benz B-Class is offered only with an electric powertrain in the U.S. Called the B250e, the battery-powered hatchback has all the refinement, equipment, and style we’ve come to expect from Mercedes cars, but it can’t match the driving range of other new EVs. Strong motor. With 251 pound-feet of torque on tap, the B250e really scoots. Select the Sport driving mode, instead of the default Eco or Eco+, and the car’s motor responds energetically, delivering bursts of acceleration in an instant. Speed builds urgently and easily at all times. Drives like a Mercedes. There’s the same progressive steering weight and firm brake pedal as in other Mercedes small cars, like the CLA and GLA, so the B250e never feels like an eco-warrior. The brake feel especially is impressive; unlike many electrics, the pedal is never spongy and never vague when transitioning between the regenerative and friction brakes. Handsome interior. The B250e has essentially the same interior layout as the CLA and GLA, with which it shares its platform, and that means it’s one of the more stylish EV interiors on the market. A bright, crisp infotainment display perches atop the dashboard, along with turbine-like air vents and unique instrument gauges for the electric powertrain. All told, it’s a stylish and well-built interior that says luxury first, eco car second. Clever regenerative-braking system. Using paddles on the back of the steering wheel, you can tailor how much regenerative braking you desire. If you want to be able to coast, for instance, pull the left paddle to select “D-” mode, which has the most aggressive regen when you lift off the throttle. “D+” mode has the least, allowing you to coast more like in a gas-powered car, while “D Auto” lets the car adjust the regen level automatically: Using the radar sensor and traffic-sign recognition, it will automatically activate the regen to slow you if you’re entering a lower speed limit or if you’re closing on another vehicle too quickly. It’s a very cool convenience feature that also helps preserve battery range. So-so electric driving range. As you can see in our handy chart, the B250e’s 87-mile battery range is pretty far down the rankings by today’s standards. 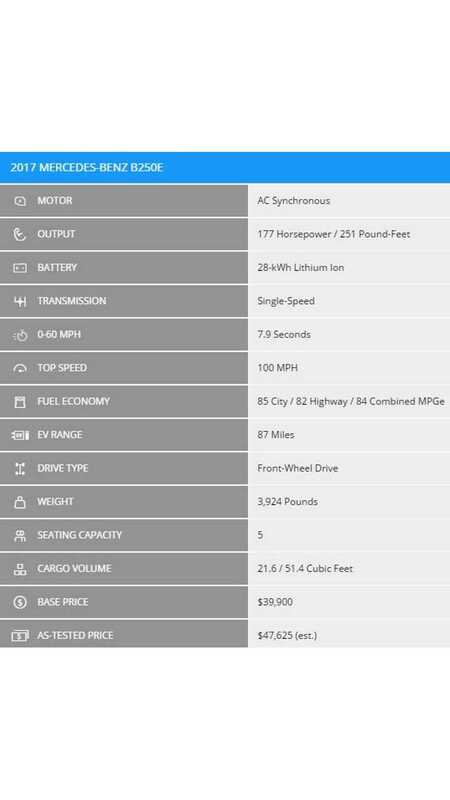 Comparably priced EVs from Nissan, Kia, BMW, and others beat the Benz in terms of range – and that’s before mentioning the 238-mile EPA rating of the new Chevy Bolt, with which it is competitively priced. Lazy throttle tip-in. The throttle tuning is exceptionally lethargic for the first inch or two of pedal travel, especially if you select the Eco+ driving mode. That’s perfectly fine for helping ensure owners drive smoothly and efficiently, maximizing driving range, but it belies the impressive torque on offer from the electric motor (see the Pros section). It’s deceptive when you’re first getting used to the B250e and it feels like it has about 77 hp, not 177. Bouncy ride. The B250e’s suspension is constantly in motion, and lots of rebound makes it bouncy going over rough roads. It’s never harsh or jarring in the way of a firmly sprung sports car, but it’s definitely far from the most comfortable Mercedes I’ve ever driven.